The HD67115 is a fully transparent RS232 / RS422 Converter that allows you to interface a RS232 network with a RS422 network. The HD67116 is a fully transparent RS485 / RS422 Converter that allows you to interface a RS485 network with a RS422 network. These converters have a LAN port used to configure the Converter in a simple and fast way, if necessary remotely too. The HD67118 is a fully transparent RS232 / RS485 Converter that allows you to interface a RS232 network with a RS485 network. Easy to get the message across the data flow control by microprocessor. The products are strong and safe for industrial use. The RS232/RS422/RS485 devices are opto-isolated with 2000 volts galvanic isolation which guarantees the protection of your PC, notebook... from spikes and surges. It is suitable for SCADA / HMI supervisory softwares and connection to a personal computer. The HD67119, USB / RS485 Converter. The devices of HD67038 serie allow to create one or two independent ports RS232/RS485 /RS422 over Ethernet connection. They are available in two Housing types: Type A and Type B (see view below). The devices of HD67648 serie allow to create one or two independent ports RS232/RS485 /RS422 over Ethernet(RJ45). Important in this type of product the installation of 2 LAN ports (RJ45) which allow to extend the Ethernet line without the use of an extarnal switch. 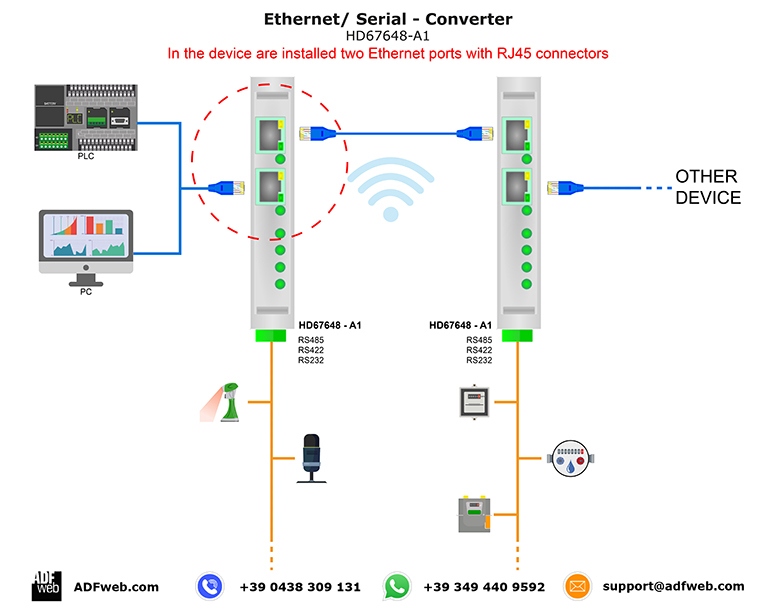 This system allows to connect other Converters of the same range or other devices such as PC/PLC to improve the topology and reduce cabling connections in serie of Ethernet LAN.